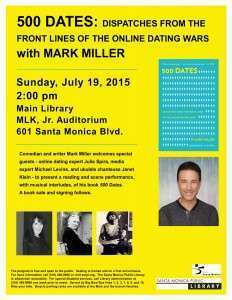 You’re invited to a fun event in Los Angeles to be held at the Santa Monica Public Library on July 19, 2015. 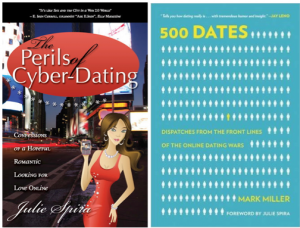 Online Dating Expert Julie Spira will be signing copies of her book, The Perils of Cyber-Dating: Confessions of a Hopeful Romantic Looking for Love Online and author Mark Miller will be signing copies of his book, 500 Dates: Dispatches from the Front Lines of the Online Dating Wars . The event will start at 2pm and will include a lively “He Said, She Said” debate on which gender has it tougher in the dating world; men or women. We’ll be answering your juicy questions on digital dating, who pays for dates, texting, and more. We’ll be joined by media expert Michael Levine and Ukulele chanteuse Janet Klein to entertain you. It will be a fun and hilarious event. We look forward to seeing you there. Today is a momentous day for me. It’s a day of great reflection and a day of digital pride. 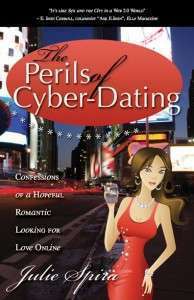 It was four years ago today on July 31, 2008, that I started writing my first book, The Perils of Cyber-Dating: Confessions of a Hopeful Romantic Looking for Love Online. Four years later, on July 31, 2012, I’m now sending out my 15,000th tweet to 25,000+ loyal followers on twitter. I’m humbled. I’m grateful. I’m filled with joy. I want this digital milestone to be meaningful and I’m honored to share this story of a powerful and passionate reinvention you. My life changed dramatically four years ago. It’s an honor and joy to help singles find love on the Internet. It’s time to share my journey. I hope you enjoy the ride. How did a broadcaster turned technology executive become an online dating expert? It wasn’t a childhood dream of mine to be an online dating expert or create Cyber-Dating Expert. It was my dream as a young child to become a music radio DJ. I considered myself a musicologist, listened to the radio non-stop and knew that was my calling. 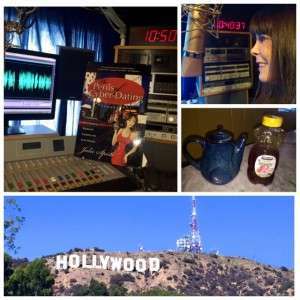 I was fortunate to have lived that dream as the first female DJ at a big FM rock station in Upstate New York, where I wanted my listeners to be enriched by sharing my favorite songs on the radio. I believed my listeners would be my forever friends. There was no such thing as BFFs, tweets, updates, and broadcasting was a unilateral. I spoke. People listened. That all changed with social media, where it?s now about the conversation and community. It appears I now have the digital gift of gab. My love affair with technology started many years ago when I became a network executive. At RKO, we were the country?s first digital-delivered satellite radio network. I was, and still am a hopeful romantic and my life was filled with music and love. I had no idea that my future would include the marriage of love and technology. It makes perfect sense now, of course. I was an early adopter of the Internet and an early adopter of online dating. Why not marry the two things I was so passionate about? So what exactly happened on July 31, 2008, and why did I feel the need to open up my entire personal life for people to read about and comment? Basically, I lost a bet at girls night out at Jazz Night at the Hollywood Bowl. It could have been as simple as flipping a coin. One could say I lost the bet. Other’s say I won. I was sharing some of funny dating stories while passing my BlackBerry around to my married girlfriends to view photos of a date I was considering going on. The odd thing about this particular date was, his mother selected me on behalf of her son on Match.com. She said I was perfect for her never-married son. I found it quite odd that she was looking for love, while playing the role of wing-woman for her son. Out of curiosity, I wanted to see how it would play out. That story ended up in Chapter 13 of my book, “The Perils of Cyber-Dating” in the story called, “The Mother-in-Law.” We never met, but it made for humorous conversation. Then the floodgates opened. I shared the story of the man who went berserk in a restaurant over 10 years earlier because he thought I looked like his recently deceased wife, the gentleman who told me graphic details of his colonoscopy while we were eating lunch, as well as the fairytale romances leading to marriage proposals. All of these stories were a result of online dating. Could I be alone, I wondered? What we all realized on that important night was that singles everywhere were struggling to find love, both online and offline. These amusing dating stories weren?t unique to me. I had spent years perfecting the Irresistible Profile and helped singles throughout the U.S. shorten their search so they could ride into the digital sunset together. I knew I had a gift. I was told from my mentor that my storytelling skills from being a media personality could be transferred to literary works. I believed him because he believed in me. When my girlfriends dared me to write a book, I laughed it off and said, “sure.” They were serious and I thought it was funny. However, I reflected to a day 13 years earlier when I decided to write a book about my online dating stories and came up with a the title of “The Perils of Cyber-Dating.” This was as a result of being proposed to by a married man. That would be perilous, wouldn’t it? I shared the love for my book title with my girlfriends who all agreed it would be perfect. Of course someone must have written this book already, I said to the girls. Then they made a bet with me. If this title had not been published, I must write the book. If it was already written, then being an author wasn’t in the cards for me. I agreed, thinking that I’d be off the hook. Certainly in all these years, there must have been others wanting to write about such perilous stories. When I returned home, I received a call from my girlfriend who was determined to win the bet. I checked online. I checked on Amazon. Apparently no one had written The Perils of Cyber-Dating. However, as a marketing and communications strategist, I knew I’d need to have the corresponding domain name. I assumed someone was blogging under this title, or perhaps it was parked somewhere. I wasn’t sure how it would pan out. I jotted down chapter titles and a few stories and went to sleep exhausted but enthusiastic about writing the book I promised myself I’d do over a decade before. The next day, I checked to see if perilsofcyberdating.com was available. Much to my surprise and joy, the domain name was available! How could this be? I asked. Then I knew it was meant to be. I had hundreds of stories that I had collected from almost 15 years. I was on the Internet before most people even knew the Internet. I had been a charter member of Love@AOL before the days of Match.com, eHarmony, and mobile dating. And so my love affair with my first book began. I wrote. I edited. I reflected. I laughed. I cried. It was empowering, healing, cathartic and more. I knew my story had to be told. There was no one else with such a unique perspective from dial-up to mobile. I knew I needed to help other singles and that humor and wit would shine along with my authenticity. 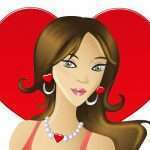 The first agent I contacted told me that no one would be interested in anyone?s dating stories. Apparently he was wrong and didn’t see the future on how dating blogs and television dating shows would rise in popularity. When I finished writing the manuscript, I created CyberDatingExpert.com as a place for singles and couples to share their online dating stories and to provide free dating advice for singles looking for love online. Readers started to submit stories for the Cyber Love Story of the Week and Peril of the Week features and commented with enthusiasm. I started tweeting about my book’s progress using my social media marketing strategies and engaging like-minded singles leading up to my Valentine’s Day launch. On the day it was released, I was filled with tears of joy. 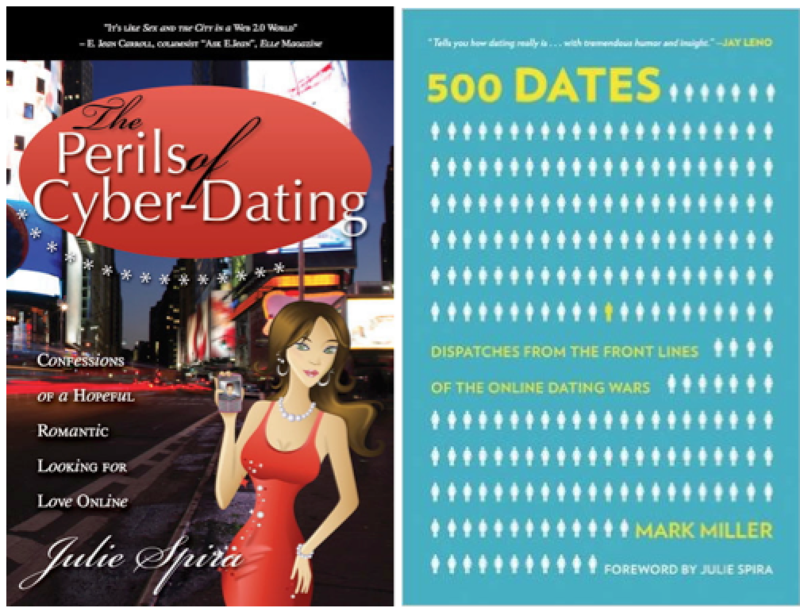 The Perils of Cyber-Dating became a best selling dating book in several categories. My passion for helping singles became known worldwide and I started coaching more and more singles every day by giving them the tools to be confident in the digital age. Words can’t express how grateful I am to have been able to reach millions with my online dating advice. Every day I thank those who have supported me on my journey. Cyber-Dating Expert is now one of the top online dating advice sites on the Internet and has been nominated for numerous awards. I’ve been named “One of America’s Ultimate Experts” by Woman’s World magazine and “The Pioneer of Online Dating” by Cosmo. Our advice has been featured and quoted in and on over 1500 stories around the world. I’ve had the opportunity to write for Betty Confidential, eHarmony, Huffington Post, JDate, Match, Your Tango, and Zoosk, among others. It’s been an honor to have been quoted on ABC, CBS, Mashable, Men’s Health, NBC and speak at the Internet Dating Conference. As online dating continues to grow and evolve with mobile dating, our team is at the forefront. Our mobile app, Dating Expert is celebrating its third year and our annual Top 10 Mobile Dating Apps list is highly respected by journalists and singles. Our team created Mobile Dating BootCamp in 2012 and we’ll be casting a second season to be held in Las Vegas in 2013. I’m in the final stages of finishing my second book, The Rules of Netiquette: How to Mind Your Manners on the Web as well as an exciting screenplay. I was just a girl with a dream, a huge heart, and hundreds of stories, who happened to be an early adopter of online dating. I now have dreams of seeing my story on the big screen and riding off into my very own digital sunset. I have a feeling my dreams will become a reality. My message to all of you is to follow your heart. Dream big and be open to the possibilities of a new beginning in both love and work. Don’t discard someone who isn’t perfect. None of us are. Be honest and authentic. Remember that patience is a virtue and the best things in life are worth waiting for. Your shelf life does not have an expiration date on it and you can ask for forgiveness and give love another chance. One of our featured couples in the Cyber Love Story of the Week found love on eHarmony at the age of 70. Find your passion and it will welcome you with open arms. Thank you from the bottom of my heart for helping me share the love every single day among 6 continents. I couldn’t have done it without you. At the end of the digital day, I wish you much love and joy in cyberspace, or wherever you may roam. As part of our Irresistible Valentine’s Celebration and in anticipation of Dr. Gian Gonzaga’s appearance on Ask the Cyber Dating Expert Show, 10 lucky readers and listeners will win a signed copy of the eHarmony Guide to Dating the Second Time Around. If you’re looking for a love that lasts, you’ll want to participate in this fun contest. All you need to do is Like our page on Facebook, and comment on the wall about your most romantic Valentine’s Date ever. Winners will be selected daily from now until Valentine’s Day. 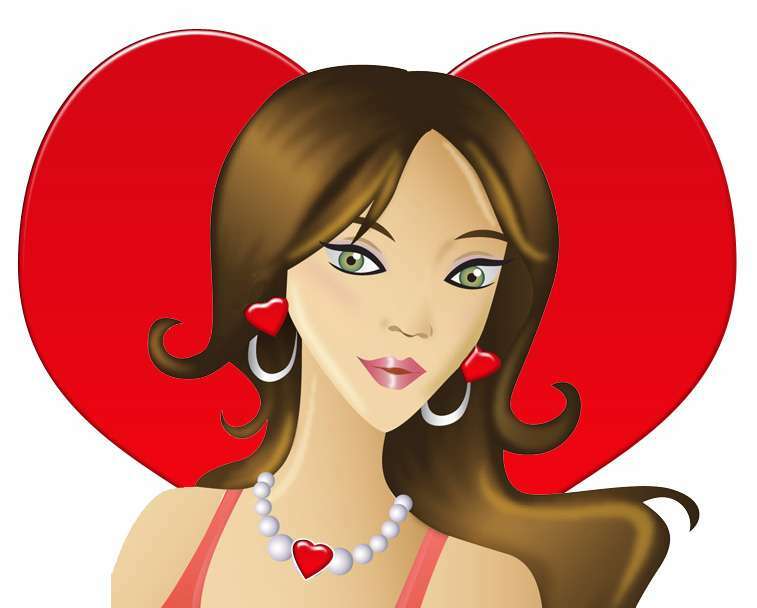 Don’t forget to tune in to Ask the Cyber Dating Expert Show on Saturday, February 12, 2011 at 2pm/EST, 11am/PST at blogtalkradio.com/cyberdatingexpert. Join in on the fun, share your online dating stories and win a rare autographed copy of Dr. Gian Gonzaga’s book during our Irresistible Online Dating Celebration. *Winners will be notified privately and must be in the continental U.S.